Following any humanitarian crises, it is very important to understand its effects and impacts relative to food & nutrition security and livelihoods of the affected population. This is made possible through rapid assessments to establish needs, existing capacities and opportunities to address the needs. In reviewing the existing capacities, one should understand the affected people’s ability to cover the needs and document any gaps, logistics of meeting the needs, supportive infrastructure, and functionality of markets to supply the required goods and services. Thus the needs analysis should be complemented with analysis of the local capacities to respond including the markets performance and other infrastructure both hard and soft necessary for efficient response. The table below provides a proper assessment checklist useful to establish the effects and impacts on food and nutrition security from any humanitarian crises. A number of tools have been developed to aid food and nutrition security assessments. The tools could be administered at either general community, household, or individual level aimed to determine needs and capacities. Other tools are used to determine markets performance, organizational capacities of service providers, and availability of necessary infrastructure to aid response. Suggested appropriate tools for different purposes and emergency phases are as listed table below. HLS (CARE) 48-hour tool (Oxfam) Coping Strategy Index. Seed security assessment Household Diversity Dietary Score. Tools markets Pre-Crisis Market and Analysis (PCMA). Seed System Profile for Regions of Concern: http://ciat-library.ciat.cgiar.org:8080/jspui/bitstream/123456789/6641/4/pb6-10.pdf 48-hour tool Rapid Analysis of Markets (RAM – needs 4 days). MARKit (to monitor markets during food assistance program) EMMA (needs 1 month; specific commodities including water). Market Analysis Guidance (MAG – IFRC). Food security assessments often broadly categorise the affected population into livelihood groupings, according to their sources and strategies for obtaining income or food. This may include a breakdown of the population according to wealth groups or strata (the Household Economy Approach / HEA provides this type of info; see http://www.heawebsite.org/ ). It is important to compare the prevailing situation with the history of food security before the disaster. So-called ‘normal years’ may be considered as a baseline. Consider the specific roles and vulnerabilities of women and men, and the implications for household food security. Consider food security differences within each household. The checklist must also be adapted to suit the local context and assessment objectives. Additional information must be collected on the wider context of the disaster (for example, its political context, population numbers and movements, etc.) and in relation to other relevant sectors (nutrition, health, water and shelter). Refer to Chapter 4 Assessment. The following draws on the Emergency food security assessment handbook (Annex 23.4). See also Annex 23.5 Food-security assessments in emergencies: A livelihoods approach. Emergency food and nutrition security interventions need to be based on a solid analysis. The food & nutrition security analysis should identify the causes of the crisis, contextual factors that may influence interventions, capacities and constraints to implement interventions, and the possible harm and benefits of interventions. This analysis should then be used to decide the most appropriate and feasible response. Has the crisis resulted in food & nutrition insecurity? Is the food insecurity issue of food availability, access, utilisation or a combination of the three? Which geographic areas and population groups are affected? Are the affected communities and households able to cope on their own? What are the specific risks to lives and livelihoods? What are the unmet needs and risks? What are the appropriate interventions? 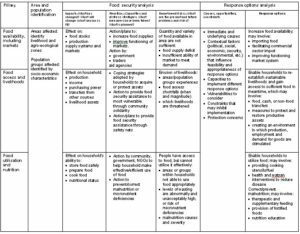 The table below provides an overview of the type of information that needs to be considered during the situation and response options analysis for each food security pillar. For a word-version of this image click here. Are there groups in the community who share the same livelihood strategies? How can these be categorised according to their main sources of food or income? How did the different livelihood groups acquire food or income before the disaster? For an average year in the recent past, what were their sources of food and income? Over a period of a week or a month, what do household expenditures include, and what proportion is spent on each item? Who is responsible for managing cash in the household? What is cash spent on? What is the availability and price of essential goods, including food? How has the disaster affected the different sources of food and income for each of the livelihood groups affected? How has it affected the usual seasonal patterns of food security for the different groups? How has it affected access to markets, market availability and prices of essential goods? For different livelihood groups, what are the different coping strategies and what proportion of people are engaged in them? How has this changed as compared with the situation before the disaster? Which group or population is most affected? What are the short- and medium-term effects of coping strategies on people’s financial and other assets? For all the livelihood groups, and all vulnerable groups, what are the effects of coping strategies on their health, general well-being and dignity? Are there risks associated with coping strategies? What information on the nutritional situation exists? Have any nutrition surveys been conducted? Are there any data from mother and child health clinics? Are there any data from existing supplementary or therapeutic feeding centres? What information exists on the nutritional situation of the affected population prior to the current crisis (even if people are no longer in the same place)? What is the risk of malnutrition related to poor public health? Is Vitamin A routinely given in measles vaccination? What is the estimated Vitamin A supplement coverage? Has anyone estimated mortality rates (either crude or under five)? What are they and what method has been used? (see Health systems and infrastructure standard 1 on page 259). Is there, or will there be, a significant decline in ambient temperature likely to affect the prevalence of acute respiratory infection or the energy requirements of the affected population? Is there a high prevalence of HIV/AIDS, and are people already vulnerable to malnutrition due to poverty or ill health? Have people been in water or wet clothes for long periods of time? What is the risk of malnutrition related to inadequate care? Is there a change in work patterns (e.g. due to migration, displacement or armed conflict) which means that roles and responsibilities in the household have changed? Is there a change in the normal composition of households? Are there large numbers of separated children? Has the normal care environment been disrupted (e.g. through displacement), affecting access to secondary carers, access to foods for children, access to water, etc? What are the normal infant feeding practices? Are mothers bottle feeding their babies or using manufactured complementary foods? If so, is there an infrastructure that can support safe bottle feeding? Is there evidence of donations of baby foods and milks, bottles and teats or requests for donations? In pastoral communities, have the herds been away from young children for long? Has access to milk changed from normal? Has HIV/AIDS affected caring practices at household level? What is the risk of malnutrition related to reduced food access? What formal and informal local structures are currently in place through which potential interventions could be channelled? What is the capacity of the Ministry of Health, religious organisations, HIV/AIDS community support groups, infant feeding support groups, or NGOs with a long- or short term presence in the area? What is available in the food pipeline? Is the population likely to move (for pasture/assistance/work) in the near future? What nutrition intervention or community-based support was already in place before the current disaster, organised by local communities, individuals, NGOs, government organisations, UN agencies, religious organisations, etc.? What are the nutrition policies (past, ongoing and lapsed), the planned long-term nutrition responses, and programmes that are being implemented or planned in response to the current situation?